Each year RCC hosts this event in honor of Cliff Carlson, a Korean War Marine Veteran. Participating golfers donate $10 in addition to their greens fees. All proceeds benefit the Wounded Warriors @ 45 North, a local NH organization dedicated to providing care and rest through outdoor activities at NO cost to Wounded or Deployed Warriors at their location in Pittsburgh, NH. Donations go toward campsite improvement, food and recreation equipment. Since starting the tournament in 2012, Rochester CC has donated over $4000 to this amazing organization and look forward to hosting these heroes as golfers each year! This fun afternoon of golf is sponsored by NLGC and The First Tee of NH along with our members, employees and many area businesses who donate their goods and time to ensure that the afternoon is a big success. This event is an opportunity to introduce a child to the game of golf and help promote golf as a lifetime activity. Children under 17 years of age are encouraged to participate and there is no charge. Children ages 2 to 5 receive instruction on the putting green and driving range while children between the ages of 6 and 17 play 9-holes of golf from our US Kids Golf Tees. Clubs are available for those that don't have their own set. A barbecue is available all afternoon for the children and their parents. Each child receives a commemorative gift along with "golf goodies" donated by area businesses. Join us during the month of July for “Family Golf Month”! 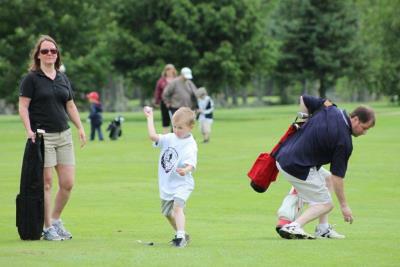 Golf is the perfect activity for any family to enjoy together, no matter what their skill level. All Junior golfers (17 and under) play free with a paid adult or member (cart fees not included). So make a day of it! Call the Pro Shop to ask about club rentals and restrictions. Rochester CC also offers a variety of Junior Golf Clinics and Camps during this month, making it easy for kids of all ages to learn golf skills and etiquette. The Richard D. McDonough Caddie Scholarship Foundation was established in 1955 to award college scholarships to caddies who worked at New Hampshire golf clubs. In the first year of operation, the Foundation granted two scholarships totaling $1,000. The Foundation expanded its mission to aid young people to include any employee, male or female, of a New Hampshire golf course and changed its name to the Richard D. McDonough Golf Scholarship Foundation. The McDonough Foundation recently awarded $115,000 in scholarship grants, for academic year 2017-18 to 76 young men and women employed at 26 New Hampshire golf courses who are currently attending 51 colleges and universities. With these most recent grants the Foundation has now awarded a total of $2,507,210 since the inception of the scholarship program. This nationwide event encourages golfers to donate monies to benefit the Folds of Honor Foundation which provides educational scholarships to families of those who have become disabled or lost their lives in the line of duty. Over $1.5 million has been raised to support this foundation since its inception. To personally thank our Veterans and members of the Armed Services for a job well done, Rochester CC invites them to come and play golf during the week. GREEN FEES are FREE with a nominal charge for use of a cart. All golfers are asked to bring items to be donated to the Wounded Warriors @ 45 North, a local NH organization dedicated to providing care and rest through outdoor activities at NO cost to Wounded or Deployed Warriors at their location in Pittsburgh, NH. Some items requested by the Veterans are Coffee, Gatorade, Socks, Foot Powder, T-Shirts, Twin Sheets, Towels, Playing Cards, Footballs, Frisbees, Hacky Sacks, Board Games, Small Handheld Electronic Games, Crossword & Puzzle Books, Books, Magazines & Other Reading Materials, Air Fresheners, Crackers, Slim Jims, Trail Mix, Energy Bars, Beef Jerky Sunscreen, Mach 3 Razors/Gillette Replacement Blades, Band Aids, Cortisone Cream, Calamine Lotion, Toothpaste, Toothbrushes, Dental Floss, Mouthwash, Qtips, Deodorant, Hand & Body Lotion, Soap, Toilet Paper and Music CDs. Even if you don't play golf please consider stopping by RCC and dropping off something for the Veterans. We all know how much it is appreciated! RCC also donates all of the lost and found clubs along with slightly used golf balls to our troops.